John Williams: A Life In Music – a brand new album of iconic movie scores by the world’s most successful film composer – including Star Wars, Jurassic Park, E.T. and many more. The album, which will be released on May the 4th (International Star Wars Day) features brand new recordings with the London Symphony Orchestra, who recorded many of the original versions, and includes a world premiere recording of Schindler’s List for cello - which has never been heard before. Recorded by an 86-piece orchestra, this epic collection of music was conducted by Gavin Greenaway and recorded at London’s Air Studios. The 10-track album features Hedwig’s Theme from Harry Potter, performed by the LSO for the very first time. The premiere of Schindler’s List is the first time Williams’ official arrangement for cello has ever been recorded. The LSO’s close connection with Williams dates back nearly 40 years, and the standard is there to be heard in these new recordings. From writing the world’s best-loved soundtracks – including Jaws, ET and the Home Alone films – to conducting some of the worlds most accomplished orchestras, Williams truly is one of the greatest living composers of our generation. Following this year’s Oscar nominations, Williams broke his own record with more Oscar nominations than any other living person – a title he first earned in 2016. Williams has also won five Academy Awards, seven BAFTAs, 24 Grammy’s, four Golden Globes, five Emmys and numerous gold and platinum records. This year, the Hollywood legend celebrates sixty years in movies. 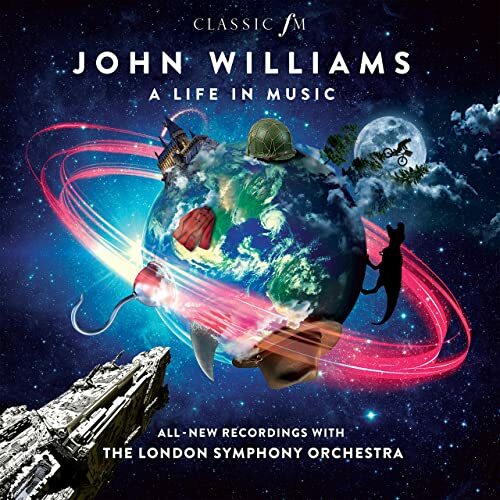 Alongside the release of this once-in-a-lifetime album, Williams will also conduct the LSO in an extremely rare performance at London’s Royal Albert Hall, making it the 86-year-old composer's first performance in the UK for 22 years. Over the span of his extraordinary career, Williams has graced the TV screens and touched the hearts of people across the world with his music, and this new album promises to do the same. 3. Hedwig's Theme - From "Harry Potter And The Sorcerer's Stone"